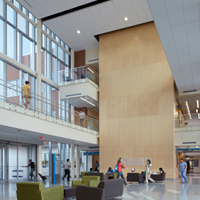 The Elgin Community College Health and Life Sciences building designed by Kluber Architects + Engineers continues to earn distinctions for exceptional architectural design and functionality. In 2014 the Health and Life Sciences building also received LEED Silver certification from the United States Green Building Council for implementing practical, measurable strategies and solutions in sustainable site development, water savings, energy efficiency, materials selection and indoor environmental quality. Kluber Architects + Engineers is a full service architecture and engineering design firm serving northern Illinois. The firm is built on a foundation of trusted and lasting relationships with their valued clients. Kluber Architects + Engineers remains committed to being industry leaders within the markets they serve, specializing in the government, education, health services and corporate/industrial sectors. Their team of seasoned professionals strives to develop innovative and client-tailored solutions that maintain project costs and schedules, working collaboratively across all disciplines to ensure creative design solutions.